Beginning July 1, 2018, any checks that you deposit using our Mobile Banking App, require a special restrictive endorsement (in addition to your standard endorsement). 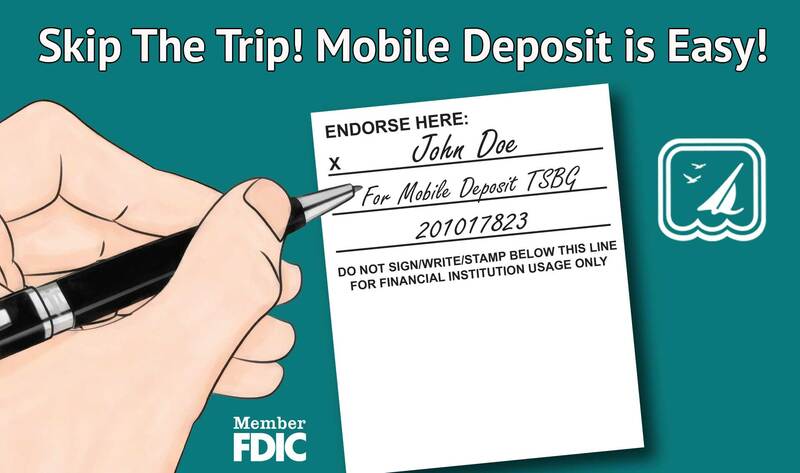 This means that when you make a Mobile deposit using your smartphone or any mobile device, you must include your name (as displayed on payee line), “For Mobile Deposit TSBG”, and account number, on the back of the check when you endorse it. If the additional endorsement is missing, or not machine readable on the checks that you submit, the deposit will be rejected by the Bank and you’ll receive notification that your “deposit was rejected due to restrictive endorsement”. To avoid any delay in crediting your account, please begin using the required endorsement at your earliest convenience. If you have any questions, please stop by any branch office or contact us by dialing 815.728.8000, option #1. Mobile Deposit is Convenient and Secure! Make deposits conveniently and securely* with your mobile device using our mobile deposit service within our mobile banking phone app*. Deposit check by phone, is Quick, Secure, and Easy. When using The State Bank Group mobile app, select "Deposit Checks" and follow the on-line instructions. With your camera enabled phone take a photo of the front and back of the endorsed check. Submit the photos and you're done! The deposit process is underway as if you had come to the bank! *Customers must be enrolled in The State Bank Group's online banking to use the Mobile App. Wireless carrier data usage rates may apply. Deposit checks directly into your eligible account using your Android or Apple mobile phone or tablet. Enter your check information and take photos of the front and back of your check. Submit your check for deposit. Get confirmation on your device. A valuable time saving feature for our customers that are seeking even more convenient banking options. Best of all mobile deposit is FREE and it is that easy! Q. Who can use The State Bank Group mobile deposit service? A. All consumer banking customers that are currently enrolled in both online banking, mobile banking and also have had an account with The State Bank Group for six months or more are eligible. Q. How do I endorse my check? A. You would sign your check as you normally would and also add “for mobile deposit TSBG” and your account number under your signature. Q. Can I deposit any type of check? Q. Is there a limit to the number of checks I can deposit? A. You may make up to ten deposits a day but only one check can be deposited per transaction. Q. What should I do with the check once I have deposited it successfully? A. You should keep the check in a safe place for up to 30-days. After 30-days and after you have confirmed the deposited funds have been applied to your account accurately, destroy the check or you may mark it with “Void” if you choose to keep the check. Q. Do we accept third-party checks? A. Only checks payable to the account holder(s) will be accepted. Q. What are the mobile deposit limits? A. $2,500 maximum daily deposit whether an individual check or several checks totaling $2,500. Q. What happens if the check I deposit does not clear? A. A chargeback fee of $35 will be assessed to your account. Q. What is the cut off time for mobile deposit? Q. How do I know if my mobile deposit was a success? A. You will receive a message that your deposit was successful within the mobile app and you will be able to view the mobile deposit history within the app along with the dollar amount. You will see “mobile deposit” in your transaction history by the end the following business day. Log in with the same username and password that was just used to set up online banking. *Availability of the service may be affected by your carrier’s coverage or mobile device’s connection to an internet service. Mobile Deposit is only available to those customers that have already enrolled in our mobile banking service and have met other qualifying terms and conditions. See our internet banking services for more information.